It appends I spend a bit of time on eBay looking for uncommon or old displays such as the famous Nixie tubes. 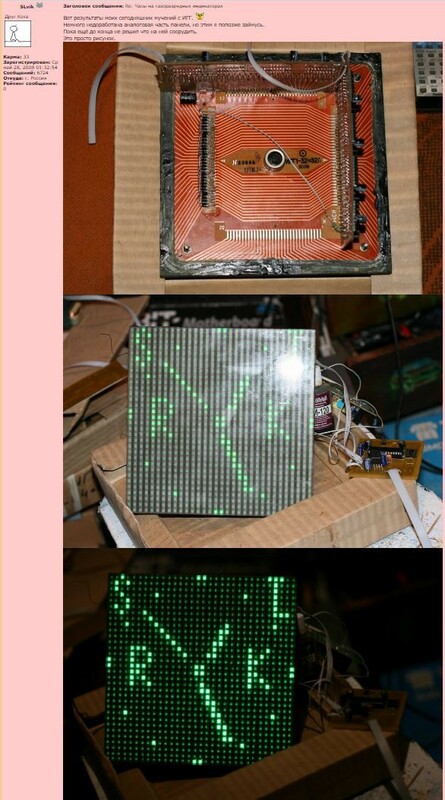 Large matrix displays emerge some time ago maybe due to the discover of an old stock. However, I never found someone using them, for a good reason. Around 360 Volts is needed to light up a pixel. Gazotron, or Газотрон is (or was) an Ukrainian electronic tube manufacturer (do not confuse with Gas-o-tron). It’s not easy to find information about this company, even gazotron.com is closed. But actually there is still plenty of their products available if you would like to buy electronic tubes, such as IN4-nixie tubes. The logo is dot inside a circle. They made in the 90’s different sort of dot matrix panels. They are quite large, 19x19cm, and for the moment I saw 3 kind of pixel composition. 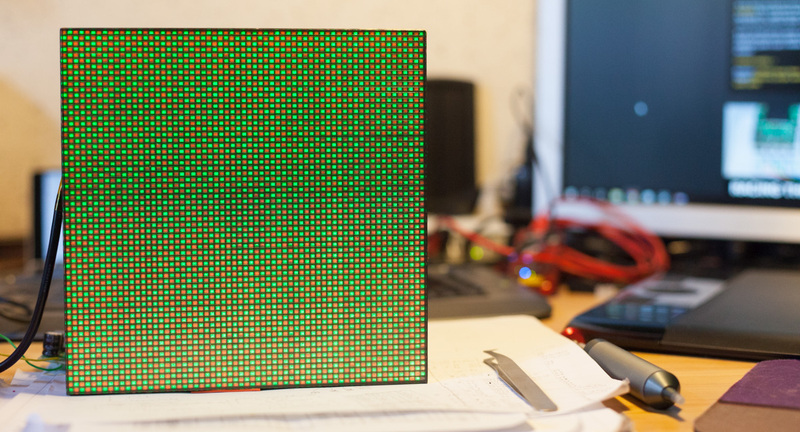 A 32×32 matrix, all pixels are green. A 64×64 matrix, pixels alternating green and red, and finally a 64×64 matrix with red-green-blue alternating pixels. I bought one green-red some time ago, and recently saw a page on hackaday.io that revive my interest. The short datasheet provided with the screens (shown in the mentioned page) explains the voltage values needed to light up the pixels as well as the timings, but it does not help to find a way to generate these high voltage signals. 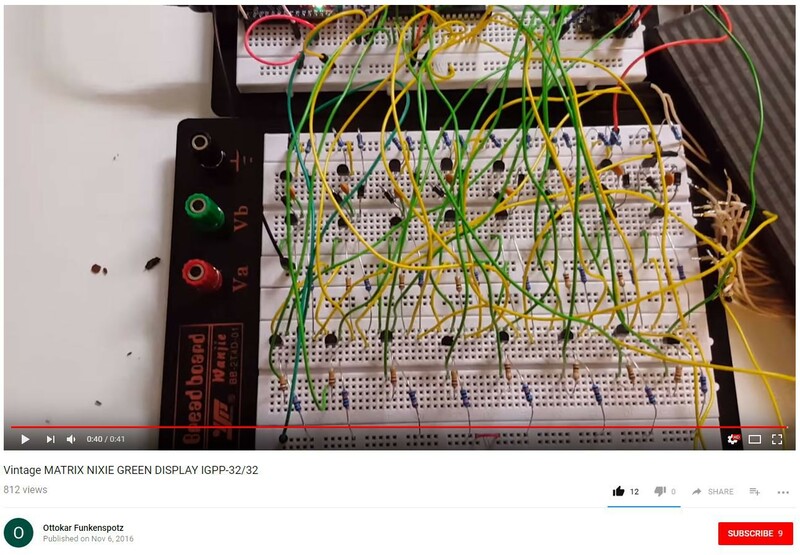 My research on internet first leads me to this Youtube video demonstrating a 8×8 pixel drive, and a quick view of the breadboard circuit. Then I start to find forums written in Russian where someone manage to drive the all 32×32 matrix. And finally, a piece of a datasheet showing a circuit example able to generate the ~400 Volts anode signal from a 200 Volts source. I reproduced the circuit on a breadboard as well, using a 180V ‘nixie’ power supply. Motivated by this success, I started Kicad and designed a PCB. I Selected SMT components in order to reduce the size of the 64 anode drivers and the 64 cathode drivers. The board arrived as perfect as usual with OSHPark. 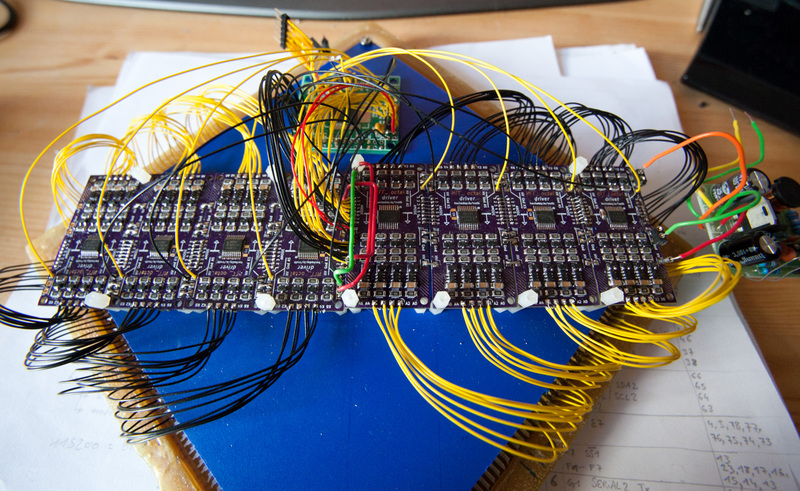 There is 92 components and 34 wires on each of the 8 boards to solder. 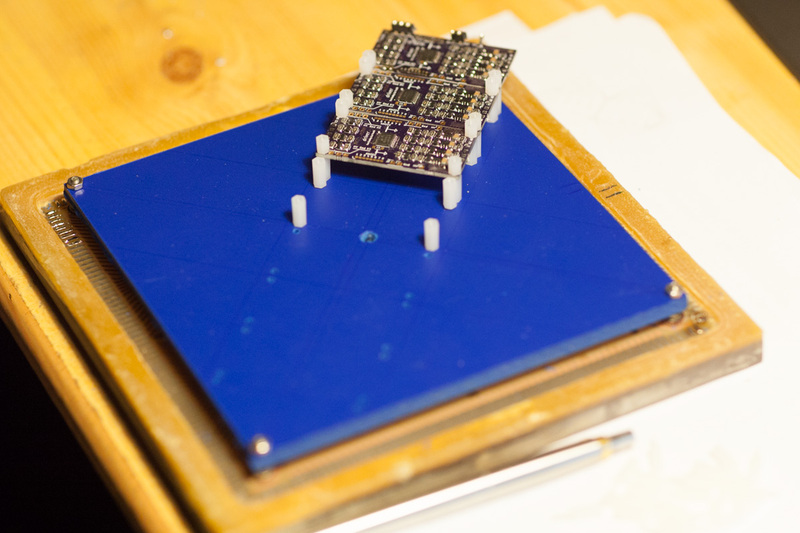 As I don’t own a air soldering station, I did everything with a good iron and solid patience. But it was worth the effort, they all work great. 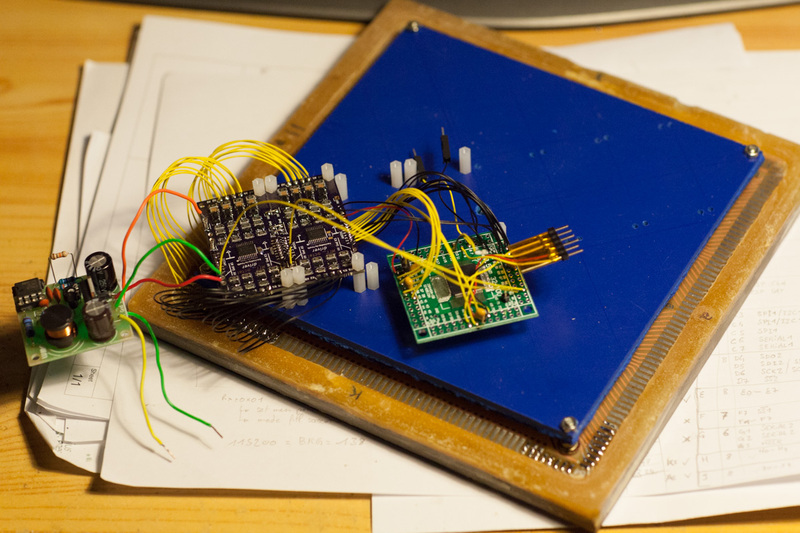 I used the same micro-controller as the BIG_CLOCK to talk with the high voltage boards. Especially because it has at least the 32 outputs needed. To interface this controller with the outside world and being able to display some useful pictures, I used the serial port. I could then make a tiny Java program that copy part of the computer screen and send it to the serial port. 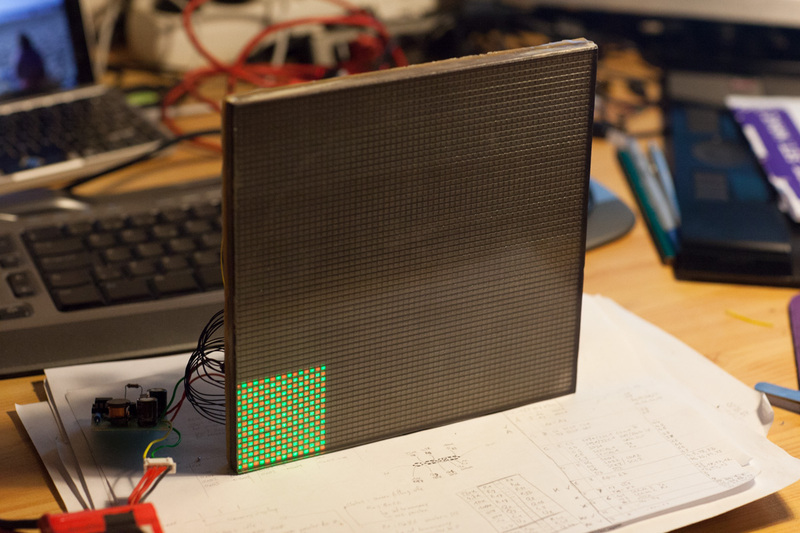 I was quite amazed by the code demonstrated on a 64×64 led matrix by Adafruit (https://www.adafruit.com/product/3649). So why not trying this on the IGG1 display? I have a MPU-9250 IMU and a raspberry-pi zero. However I need to adapt the code for this accelerometer, and send the data to the screen with the serial port. 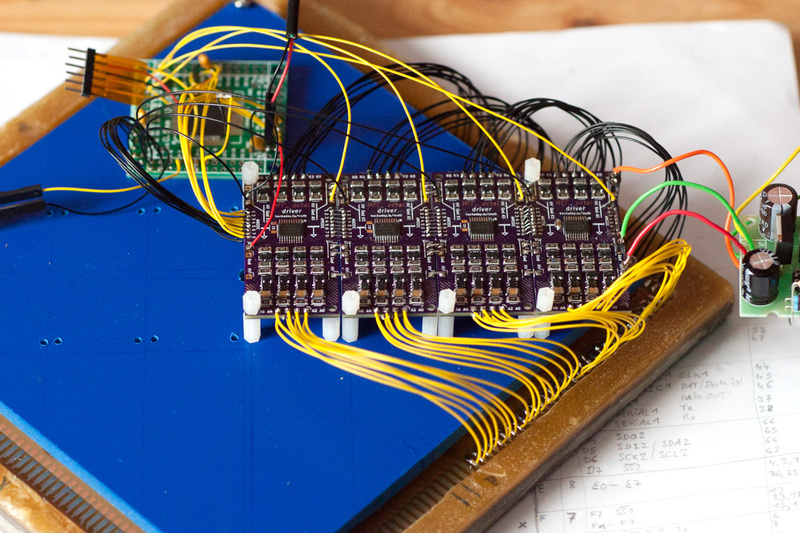 I’m more comfortable with Java than C or python, then I translate the code from Adafruit in Java. This entry was posted in Micro Controller and tagged adafruit, dot matrix display, ИГГ1-64/64M, gazotron, hackaday.io, high voltage, IGG1-64/64M, IGG1-64x64M, Java, microchip pic, nixie, OSHpark, raspberry pi, vacuum display, VFD display on March 25, 2018 by pierremuth. I recently wrote a project page about re-purposing a flip-dot bus display for the Anti-proton Decelerator control-room. It maybe interesting to show you with pictures how this synchrotron looks like. The Anti-proton Decelerator (AD) is a 182 meter long synchrotron. Its aim is to lower the energy of anti-protons. In contrary of the majority of the existing synchrotrons, the AD is used as a decelerator, producing low energy anti-proton and send them to different experiments. For the details, have a look on the official web page. Without entering into the details it consists of beam sensors and fast kicker elements (electro-static). The sensors signal is amplified and transmitted to the kicker elements that are installed at the opposite side of the ring. The transmission is faster than the particles take to make half a turn of the synchrotron. I hope you enjoy this little tour, and thank you for reading. This entry was posted in Uncategorized and tagged anti-proton, anti-proton decelerator, antimatter, Cern, synchrotron, tour on March 8, 2018 by pierremuth.